February 7, 2019–Shots rang out from a video depicting a chaotic combat scenario, soldiers taking fire while racing through the woods toward a man down, shot in the face and bleeding profusely. Dr. Bob Buckman’s presentation had begun. 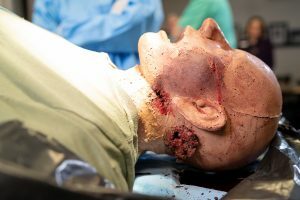 A retired trauma surgeon, Dr. Buckman founded Operative Experience Inc. (OEI), a company that has consistently been awarded funding by the U.S. Army and USAID to develop high-fidelity surgical simulators. 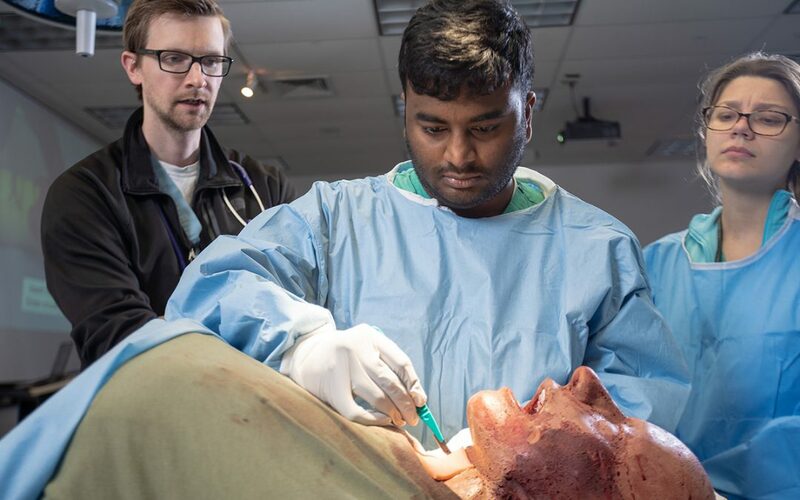 He believes that combat-relevant training such as that provided by hands-on experience with the true-to-life simulators coupled with rapid trauma skills curricula, provides a complete surgical training system that compares favorably to current programs. 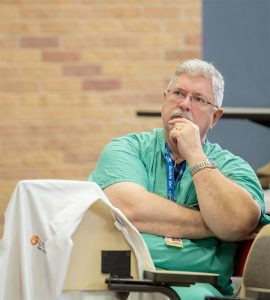 “Simulators provide a means for systematic training that gives medics and surgeons a logical progression for an operation that is much better than the way I was trained,” explained Buckman to a roomful of surgical students, fellows, residents and faculty at the UT Health San Antonio Medical School in late January. 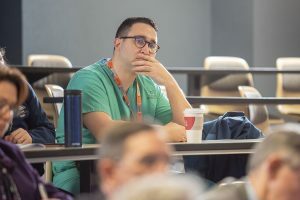 Buckman was a professor of surgery and chief of the trauma service at Temple University Hospital and, subsequently, trauma director at St. Mary Medical Center in Langhorne, PA. He served at the Walter Reed Army Institute of Research during the Vietnam era. Then, as an activated U.S. Army reservist, he cared for hundreds of casualties, mostly Iraqis, at a casualty clearing station and field hospital during Operation Desert Storm. 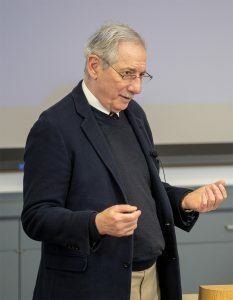 Having unusually extensive experience with penetrating injuries, he had written and lectured widely on their practical management before conceiving of a better way to teach what he knew. Illustrating his training program in the Johnson Center for Surgical Innovation, Dr. Buckman showed residents and students a brief video pacing through a tracheotomy technique, and then presented them with OEI’s latest simulator: a patient who has sustained a gunshot wound to the face and mouth, drowning in his own blood. 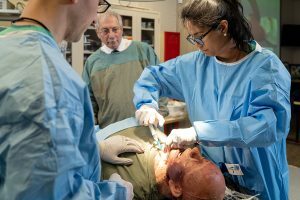 The model moved, made noises and spurted blood while, one by one, the UT Health residents practiced the procedure to find the airway, cut through the tissue of the neck, insert a trache tube and balloon below the injury, and pack it to stop the bleeding. With project coordination provided by the National Trauma Institute, OEI’s development of this Airway Simulator was sponsored by the Department of the Army, Prime award W81XWH-15.2.0089. The U.S. Army Medical Research Acquisition Activity, 820 Chandler Street, Fort Detrick MD 21702-5014 is the awarding and administering acquisition office. The opinions, interpretations, conclusions and recommendations are those of the author and are not to be construed as official or as reflecting the view of the Department of the Army or the Department of the Defense. 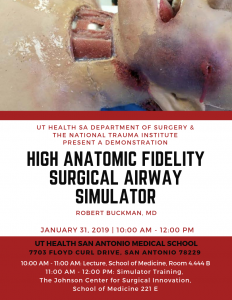 Dr. Donald Jenkins, Associate Deputy Director of the UT Military Health Institute at UT Health San Antonio, sponsored the simulator demonstration. Attendees discussed follow-on research regarding simulators. 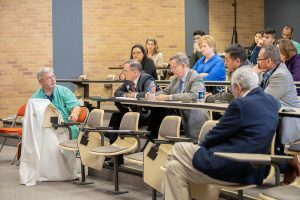 A surgical resident at UT Health San Antonio listens intently. Dr. Bob Buckman lectures on advances in training simulators. Dr. Buckman observes the first resident performing on the airway simulator.